Me and Earl and the Dying Girl -Blu-ray Review - ReDVDit! 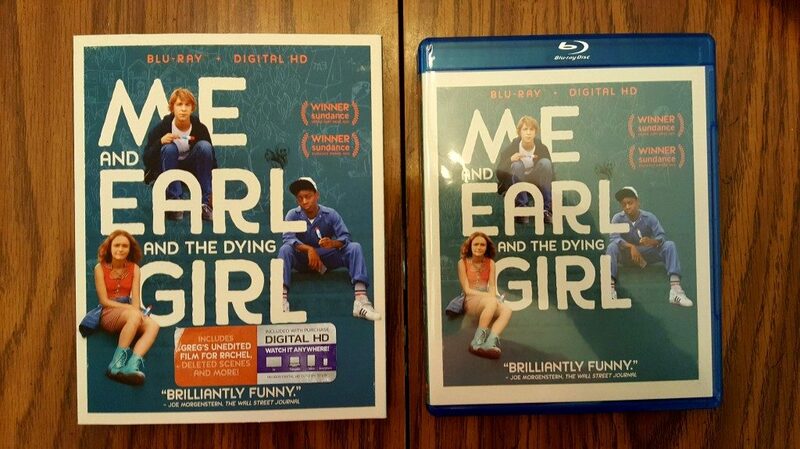 It would be easy, after seeing the trailer, to dismiss Me and Earl and the Dying Girl as your typical coming of age indie drama. Especially considering over the last few years they have become more and more frequent as the indie genre has become a kitsch thing, a cool thing for people to brag about enjoying. That is only a good thing if more good films come out of it, films like Me and Earl and the Dying Girl. However it is not your typical coming of age story, instead it is a story of a teen coming to grips with loss and finding out who he is through his interactions with those that are closest to him. It is unusual that this movie did not get a lot of attention, unfortunately I do remember quite a few strong worded reviews about a dislike for this film. However, this film has a ton to offer. It brings a unique point of view to an already unique story. Based on the book of the very same name Jesse Andrews delivers us a screenplay to remember. Our film follows a high-schooler named Greg who has worked hard at establishing a life of somewhat anonymity within the vast ecosystem that is his high school. Greg spends most of his free time coming up with adaptations of classic films with his “co-worker” Earl who is actually his best friend. Everything for Greg changes when his mom forces him to hang out with Rachel, an acquaintance who he has been diagnosed with leukemia. Rachel forces Greg to face some very hard truths and eventually Greg agrees to make her a film. The film for Rachel turns out to be the hardest challenge he has ever faced. The journey of self discovery Greg has to go through is an all familiar life changing process most of us have gone through ourselves. The film hits close to home in a very real way with stand out performances from a couple of unknown young actors. The actor that plays Greg (Thomas Mann) comes across absolutely genuine and was a perfect casting choice by Angela Demo. The film was shot using an Arri Alexa and was done so beautifully. So many of the most memorable moments in the film are shot in a rather unique way. Director of Photography Chung-hoon Chung and Director Alfonso Gomez-Rejon really managed to create a unique world within the film. Many of the shots involved rather difficult techniques however the results are stunning and seamless. Even rather standard shots turn into complex well planned out shots as both the Director of Photgraphy and Director consider the camera itself to be a character driving the story. 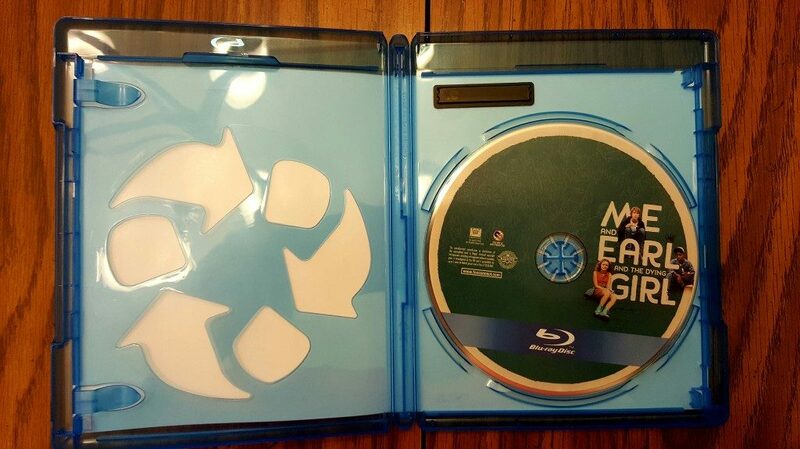 The transfer to Blu-ray is outstanding giving each scene a bright and distinct look to it. The film has a rather eclectic soundtrack that sets the tone perfectly with the odd combination of old and new songs alike. We are left with an oddball assortment of songs just like the characters and the story that unfolds. Many of the songs we hear throughout the film are signature songs that instantly remind you of classic films, many of which Greg and Earl recreate. The soundtrack does much to tell the story using artists like Cat Stevens and Explosions in the Sky delivering a wide range of emotions as we travel through Greg’s journey of loss and how he will ultimately handle that loss. 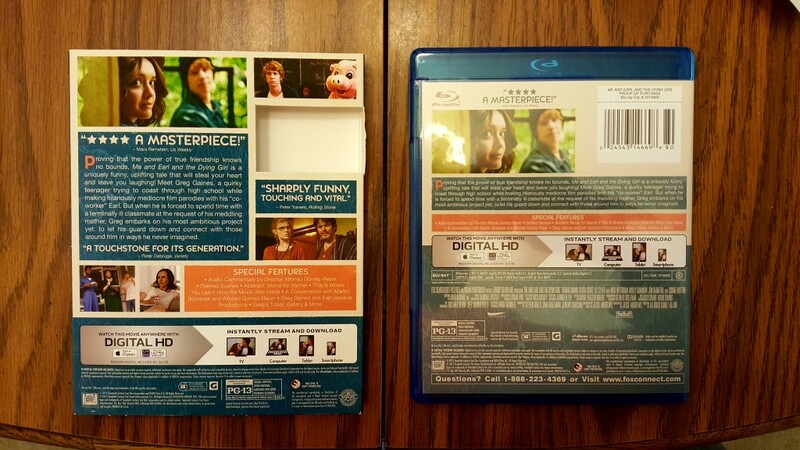 This version of the film came in pretty standard packaging however the slip cover has a really nice matte feel to it and adds a really nice look to it. Unfortunately again we are left with a sticker that is near impossible to remove cleanly (as seen above). The cast and crew take us through the different aspects of the making of the film from the novel and screenplay to the humor in the film. Cast and crew takes us through the different settings within the movie a lot of which takes place in author and Screenwriter Jesse Andrews’ Hometown. The cast takes us through what it was like to shoot the movie in a linear fashion, and how emotionally stirring the performances had become. The complete list of all the films that were remade by the two characters and the names of the original films they were based on. I absolutely enjoyed this film. It is very clear by not only watching the film but the features as well that the heart and soul of Director Alfonso Gomez-Rejon went into the making of this film. Sometimes you can watch a movie and really got lost in what the story and the cast were trying to convey and this movie has it in spades. You definitely go in expecting to walk out with some tears, however there is also quite a bit of humor throughout the film and that makes it all the more worthwhile. It has all these bits of real life scattered throughout that you really feel connected to the story because it feels rather established as a real world scenario and these could be real people. I highly recommend this film and this edition it is well worth the purchase. You can find this edition HERE. Podcaster, Movie Reviewer, and Film Fanatic. I have been collecting Movies since I was 7 years old much to my wallet's dismay. Big Fan of Box Set's and Criterion.